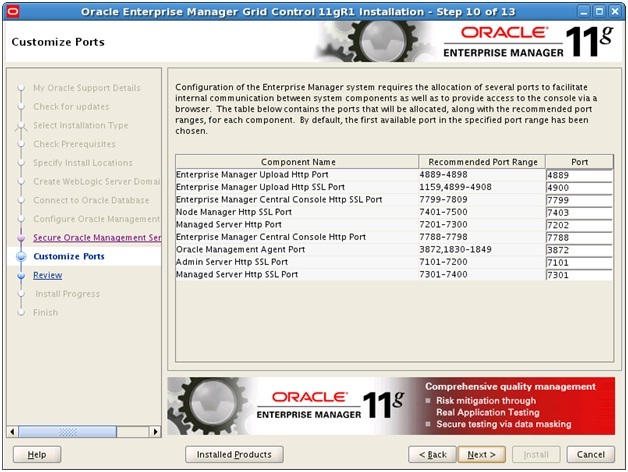 Grid Control 11g interface may have the same look and feel as the Grid Control 10g, but under the hood it is quite different. 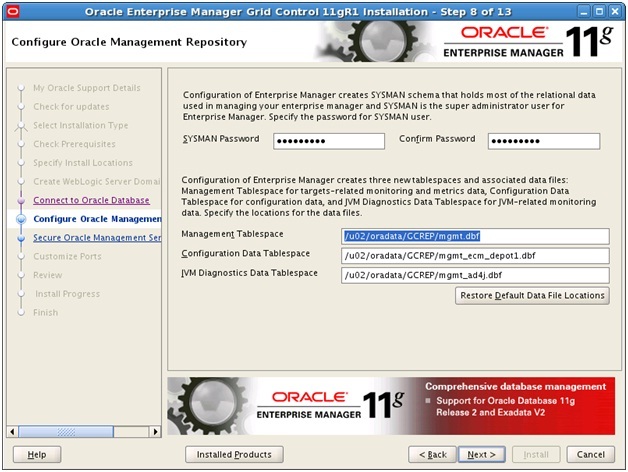 In version 10g, the OMS was a J2EE (OC4J) application deployed on the Oracle Application Server. 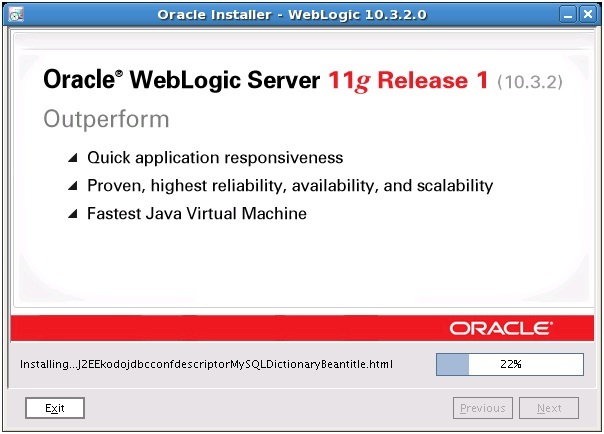 Whereas in version 11g, the OMS is deployed on Web Logic Server (WLS) . 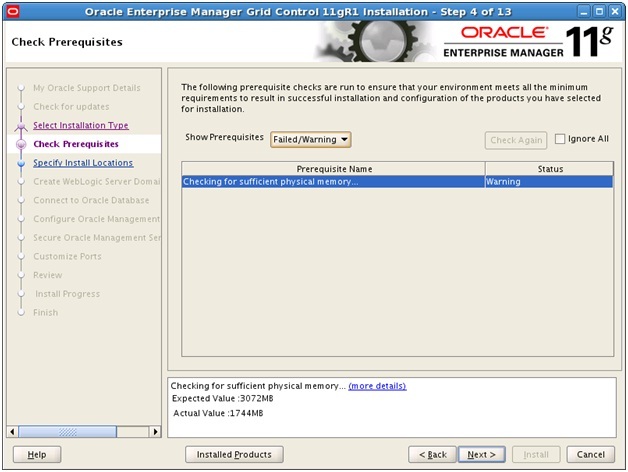 For this post, I have provided some simple steps on how to install the Grid Control with minimal pain. The table below lists the configuration that will be used for the following demonstration. * SYSMAN is actually the application schema created in the GC. This is also the super administrator for logging into the EM Console. 1. 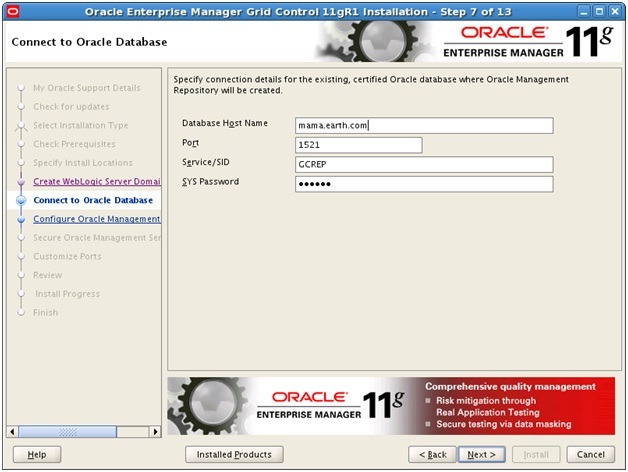 Verify the OS platform and supported Database version for the Grid Control Repository that is intended to be installed is supported. 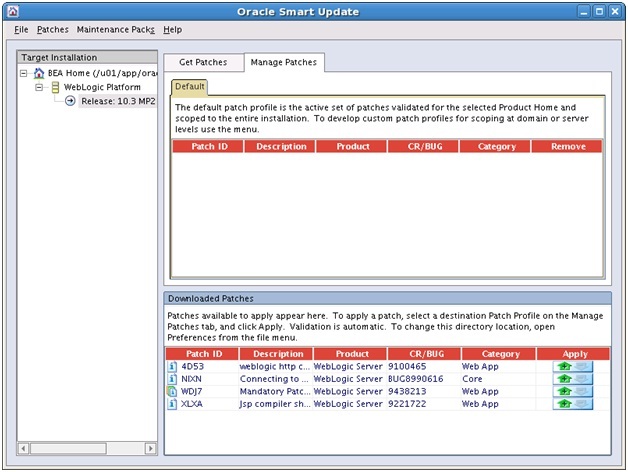 See My Oracle Support Note 412431.1 for further details. 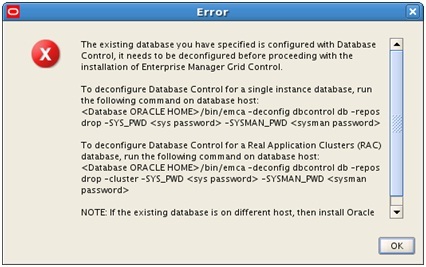 NOTE: When creating the database do not configure Enterprise Manager during this step. 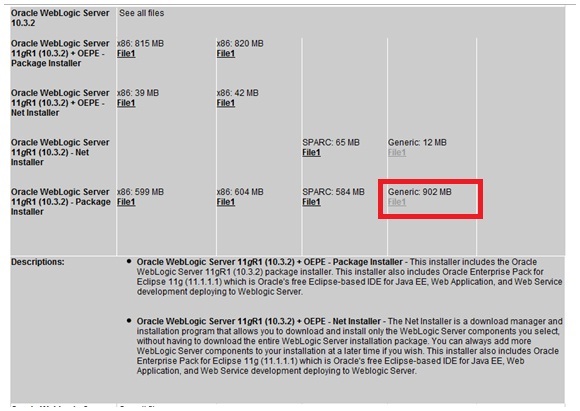 NOTE: According to My Oracle Support Note 1063762.1 make sure that the JDK version 1.6 Update 18 is used for installation of WebLogic on Linux 64-bit (x86_64) platform. 5. Create the base directory for JDK and copy the file jdk-6u18-<os_platform>.bin to the new directory. 10. 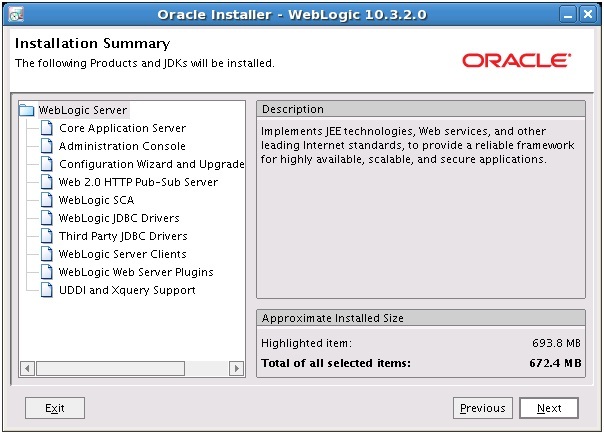 This should now complete the installation for JDK. 11. 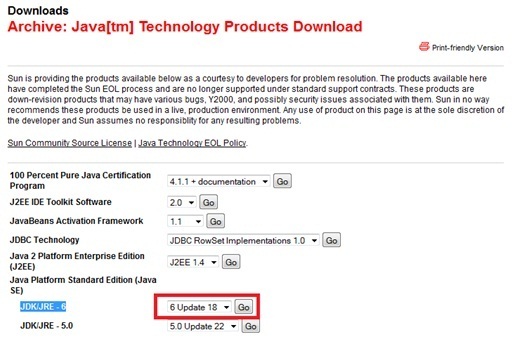 Verify that the new JDK directory jdk1.6.0_18 has been created. NOTE: For this example, the installation will be performed on linux 64-bit platform, hence the Generic file version will be downloaded. If running windows (32bit – x86) or Sun (64bit – SPARC) then please download the alternative as listed below. 4. 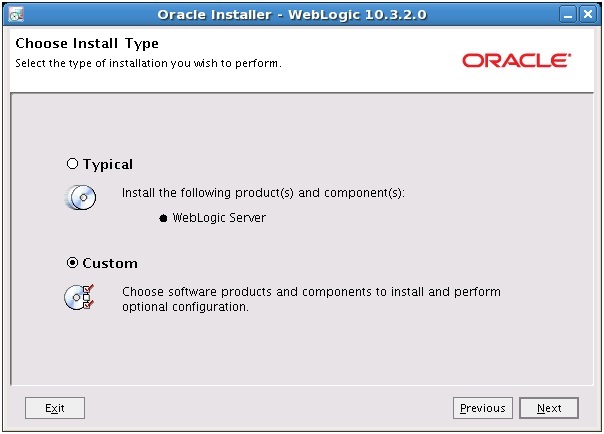 The WebLogic Installer screen now appears, to continue click on Next. 5. 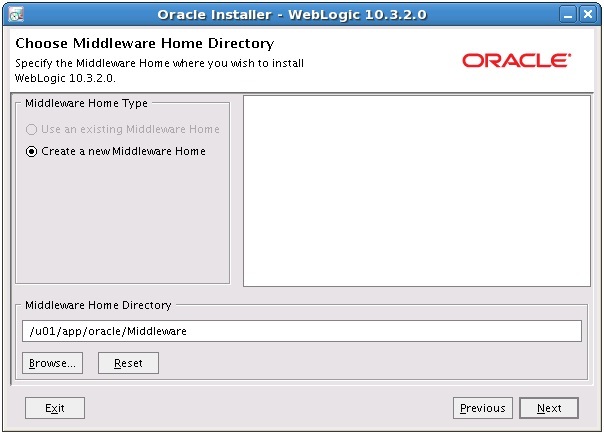 Enter a new Middleware Home Directory (eg. /u01/app/oracle/Middleware) and then click on Next. 6. Register for Security Updates, leave default and click on Next. 7. 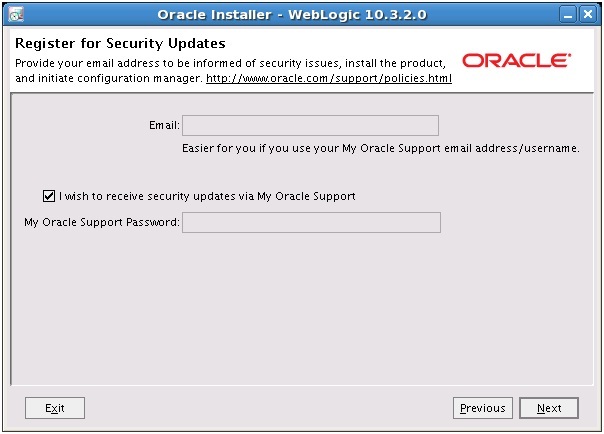 To continue click on Yes, if you wish to ignore setup for notification of security updates. 8. To skip configuration and continue to ignore setup for notification of security updates click on Yes. 9. 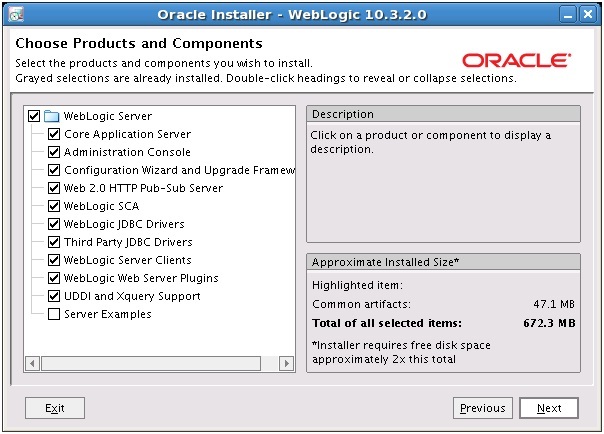 Select Typical for the installation type to perform and then click on Next. 10. Leave default options selected for Products and Components and then click on Next. 11. 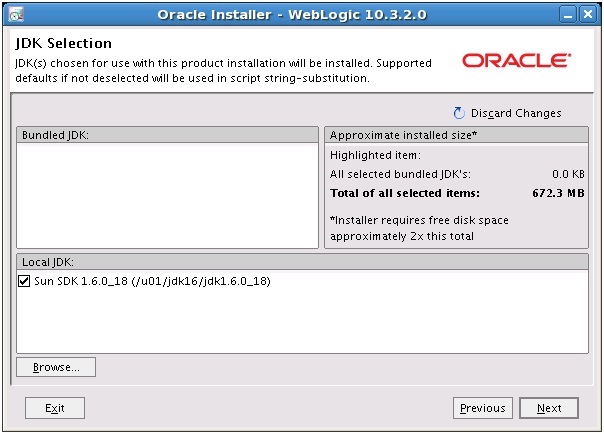 Verfy the JDK installed has been detected by the Oracle Installer for WebLogic and then click on Next. 12. 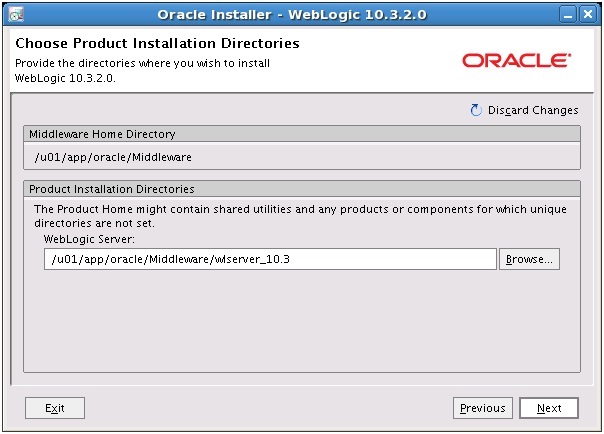 Verify the default Product Home for WebLogic Server (eg. 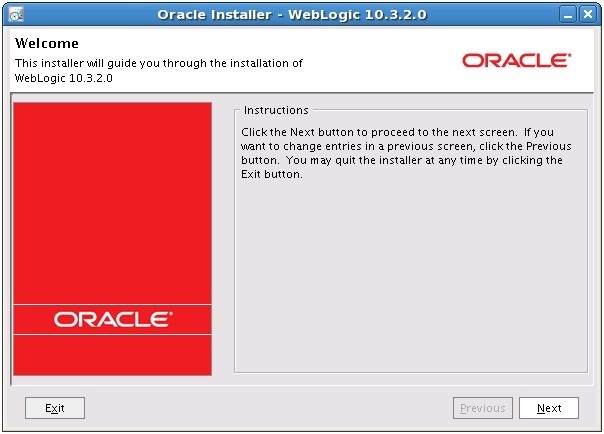 /u01/app/oracle/Middleware/wlserver_10.3) and the click on Next. 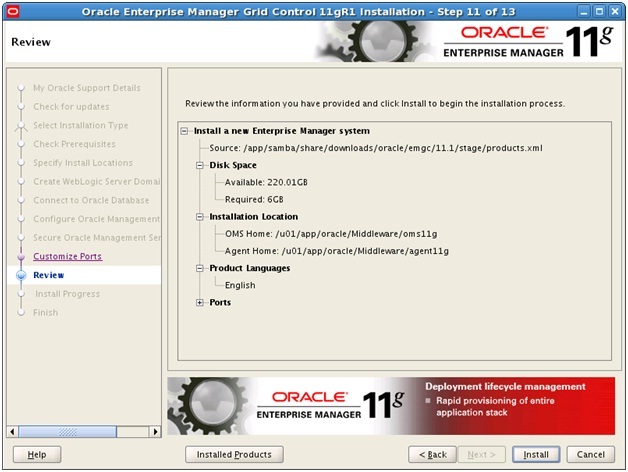 13. Review the Installation Summary and click on Next. 15. 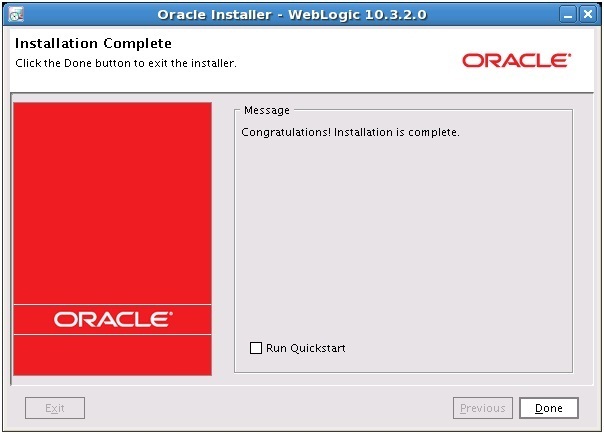 Installation is now complete, deselect the option Run Quickstart and then click on Done. 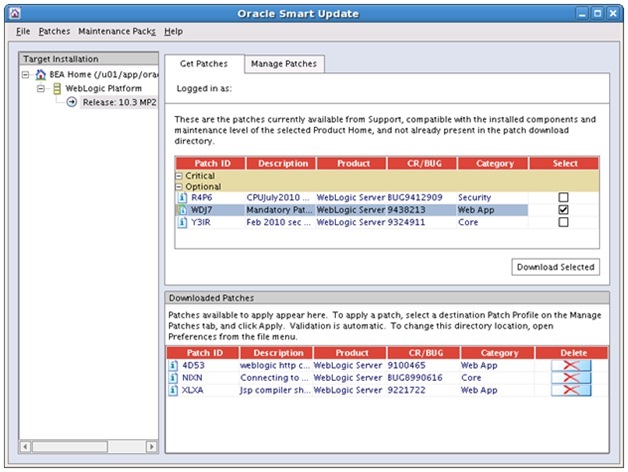 It is strongly recommended that the Weblogic patch WDJ7 patch is applied before installing the Grid Control 11g software. 3. 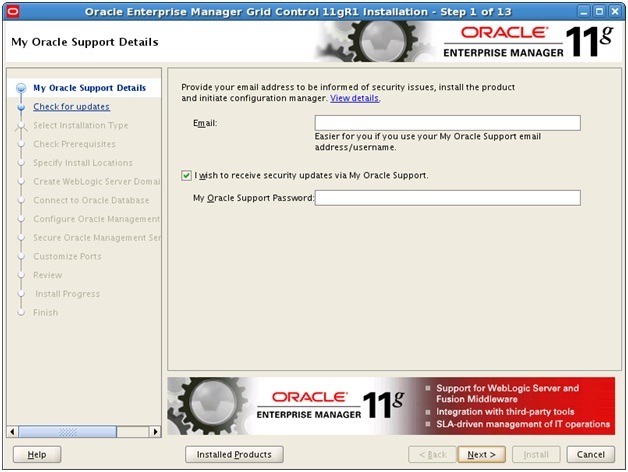 Enter My Oracle Support* User Credentials. 4. Please wait as eSupport validates the user credentials. 5. This will refresh the library of patches available for download. 6. 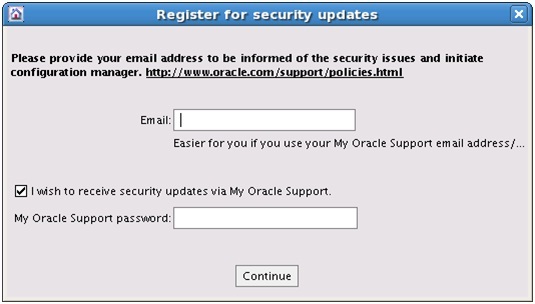 Complete registration for security updates or you may ignore and click on Continue. 9. The Smart Update Screen should now appear. 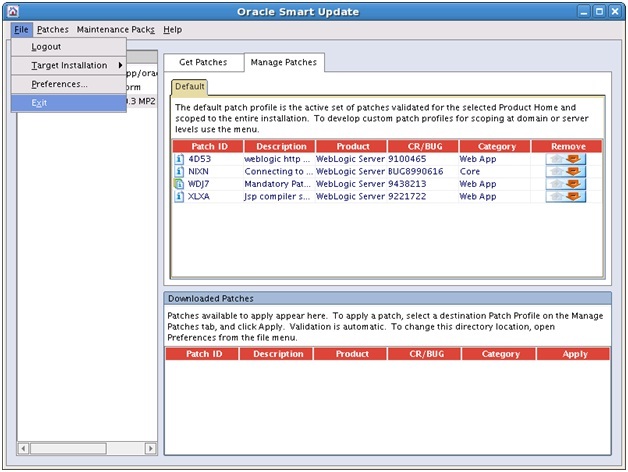 Go to the Get Patches tab and select the WDJ7 patch and then click on Download Selected. NOTE: Highlight Patches from the top menu and then select on Refresh View to get the latest listing of patches available for download. 10. 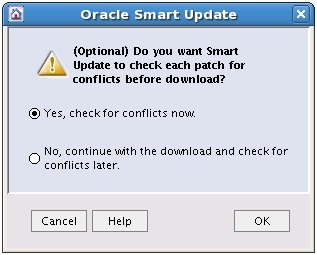 Say Yes, to check for conflict of each patch and then click on Ok.
11. 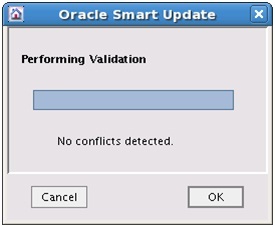 Please wait for validation to be completed and then click on Ok.
12. The WDJ7 patch has now downloaded. 13. 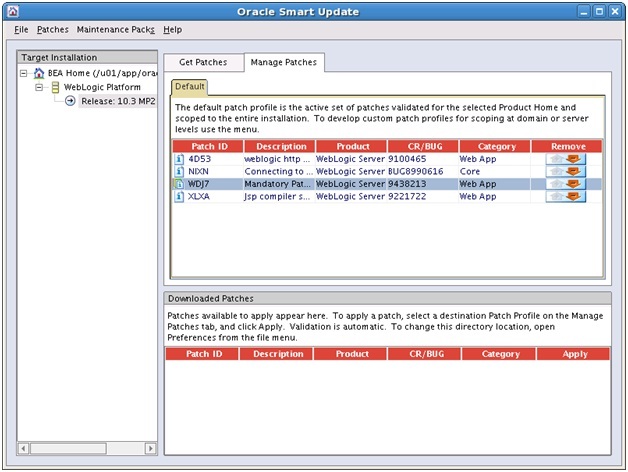 Click on the Manage Patches, Then click on the button for WDJ7 patch located under the Apply column. 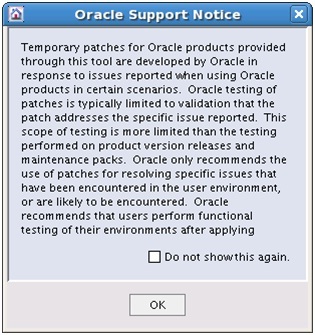 14. Review Oracle Support notice information regarding patches, and then click on Ok to continue. 15. 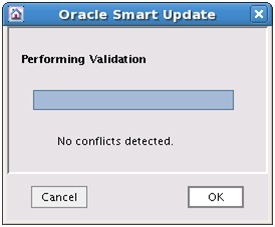 Please wait for validation to be completed and then click on Ok.
16. The patch should now appear in the top window of the Manage Patches tab. This verifies that the patch WDJ7 has been applied successfully. 17. 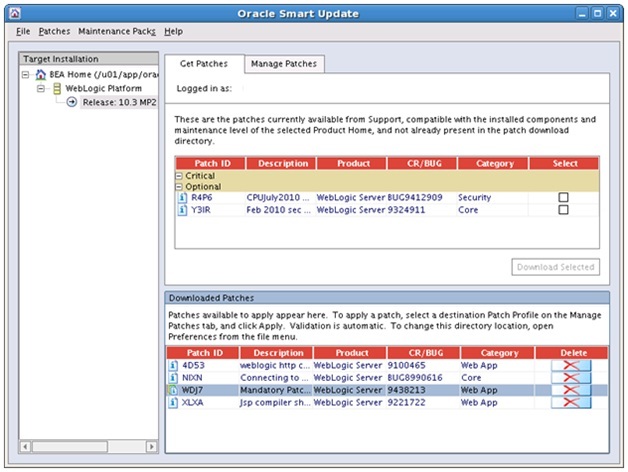 This completes the patch update and the Smart Update program for WebLogic can be closed. Click on File and then on Exit. 5. 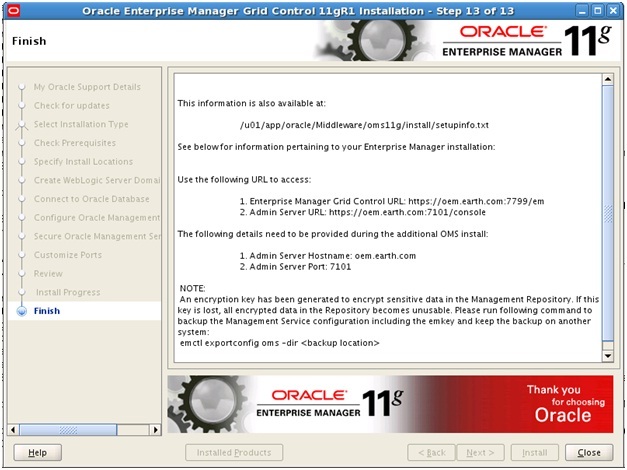 The Grid Control Installer screen now appears. 6. Register for Security Updates or leave default and click on Next. 8. Leave default to Skip Software Updates and click on Next. 9. 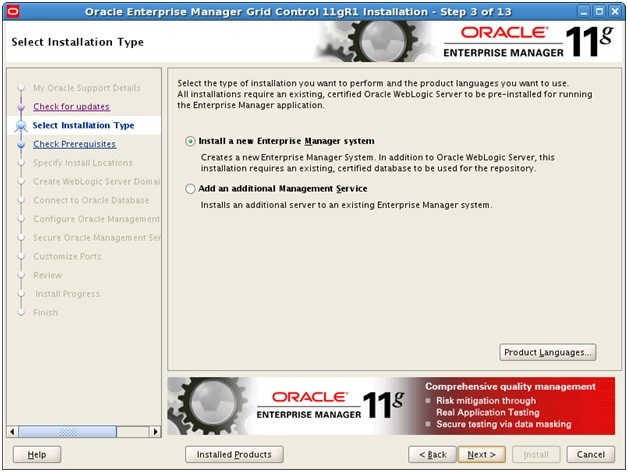 The default option of Install a new Enterprise Manager system is selected. Click on Next to continue. 10. Prerequisite checks will be performed. 11. Any failures or warning will be reported. Resolve issues according and click on Next. 12. 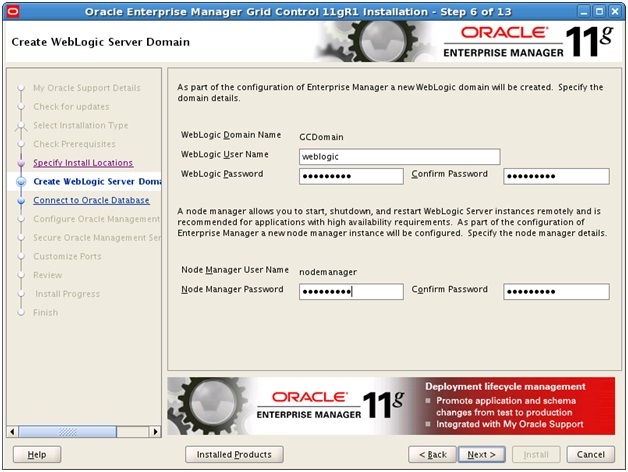 Enter Passwords for the Weblogic Domain Administrator (weblogic) and Node Manager (nodemanager) and then click on Next. 13. Enter the database connection details for where the Grid Control Repository will be deployed to. If the following error message below is reported, the installation has detected existing metadata objects in the Database for DB control. Otherwise continue on to the next step. INFO: This operation is being logged at /u01/app/oracle/cfgtoollogs/emca/GCREP/emca_2010_08_25_19_55_08.log. 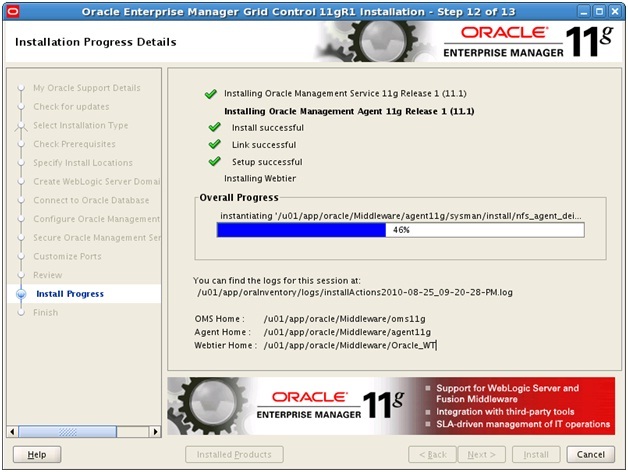 Then return to the Grid Control Installation wizard to continue. 14. Set the sysman password and verify that the location of where the tablespaces will be created and then click on Next. 15. 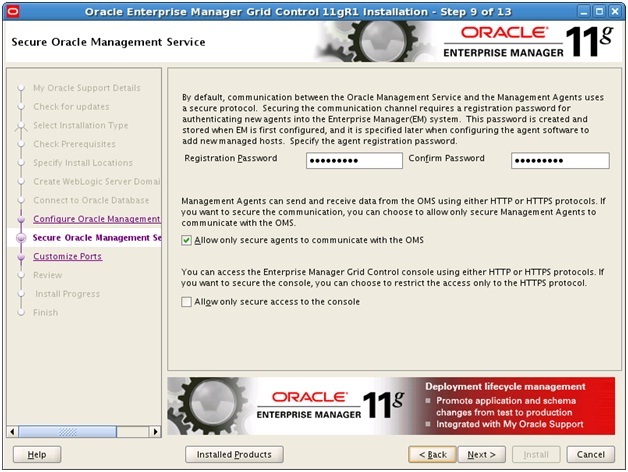 Set the registration password for securing communications in Grid Control. Uncheck the option for “Allow only secure access to the console” and then click on Next. 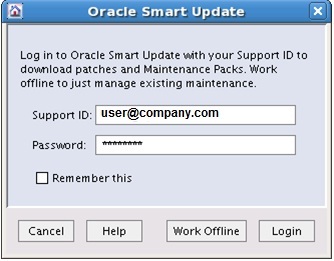 NOTE: This is the password that will be used to secure and register agents with the OMS. 16. Reconfigure ports as required, otherwise leave default and click on Next. NOTE: Make sure that ports are accessible across the network. Enable firewall policies if required. 17. Review the Grid Control installation summary and then click on Install. 19. 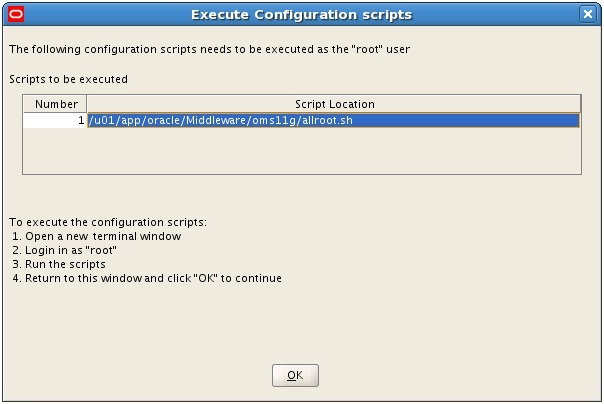 The root configuration scripts needs to be executed as recommended before proceeding. In a new terminal session, as the super equivalent user (eg. root) execute the allroot.sh script. 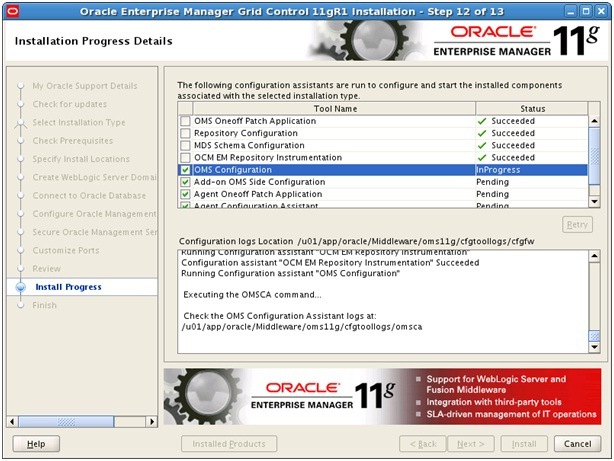 Then return to the Grid Control installation wizard and then click on Ok to continue. 20. The installation configuration assistants are now in progress. Please wait for this to complete. 21. This now completes the installation. The following detail list how you can access the EM console and Adminstrator Console. 1. Add the following entries of the ORACLE_HOME for OMS and AGENT in the ORATAB file. NOTE: All hostname, IP addresses, URLs and ports mentioned above are used for demonstration purposes only.